It is hot. Damn hot. Arayo and I have been on the road for two days in this heat and we have logged nearly 500 miles a day. At least the car has air conditioning. My back hurts so I pop another aspirin. It beats being outside in the heat. The campground we were heading for in Nebraska City is under water. Thank goodness I have a friend back home who is enjoying finding me last minute campgrounds. We head on into Iowa and the tent goes up in the dark. After everything is moved into the tent, I check more closely and the site is reserved for someone else. I have to move the tent. Grrrrrr..... Things are not going well. Lewis and Clark had to be mad men by the end of their journey - traveling in heat like this. I remind myself I'll not think this so bad when I'm living in a tent in a freeze zone being pelted with hail and knocking the ice off my toes. The self talk doesn't help at the moment. 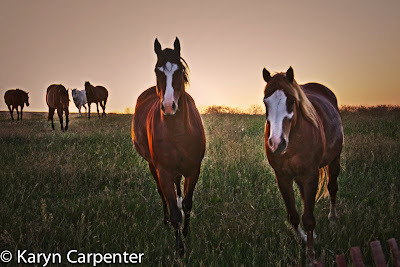 Photo: The horses were uninterested in posing as the Nebraska sun was setting. They were fixated on grazing instead. When I brought Arayo to the fence, however, they ran to check out the big dog. Maybe we'll have to get you a massaging back rest for driving.